Comfort! for your feet Mark Notton is at the forefront in comfortable footwear, with current and perfect designs for active women. Who gives more? 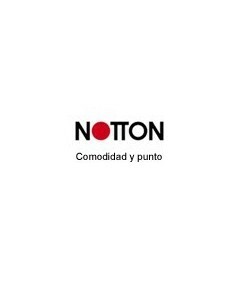 If you are looking for a pair of shoes that accompany you 7 days a week, 24 hours a day, the new collection of Notton have to discover it. this lace-up shoe is available in two shades of true light and color. -Black, always classic, timeless and much-needed a wildcard for all your looks. -Bordeaux, the shine of patent leather will give a special touch to your outfits, is a winning tone for this season. the outside is made of patent leather with a very intense glossy finish, with only flashes. For the interior is textile hypoallergenic touch second skin for a perfect harmony between breathability and flexibility. Has removable insoles, so it is a perfect shoe for use with custom insole. Shovel has a clean and simple design with special detail of the eyelets for laces in metallic tone. A touch very tendency this season. The toe is rounded, with the perfect balance between comfort and design. Has rubber sole with finish grooved and jagged, to prevent slipping. The floor has a height of 4.5 cm and a front platform 2.5 cm. Designed and manufactured by Notton in Spain. Enjoy life and comfortable walking by she was never so easy. Notton designs allow us to reach further than ever before.